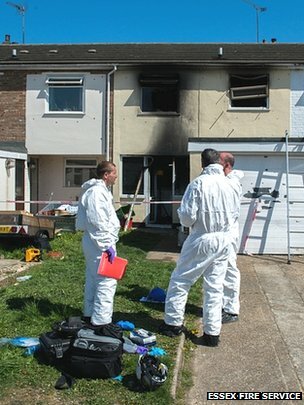 A man has died in a “severe” fire that tore through a terraced house in Essex. 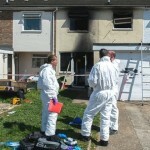 Seven fire crews battled to get the fire under control, in Stanley Road, Clacton on Monday morning. Woman and a toddler were rescued by neighbours in Stanley Road, Clacton, after smashing a bedroom window but the man could not be saved. It is believed rescuers pitched a ladder to a first floor bedroom to bring the woman and child to safety. The M42 near Birmingham was brought to a standstill on Friday morning after a lorry caught fire. The blaze started on the southbound carriageway near Shirley before 5am and caused gridlock during the morning rush hour. The vehicle was on the hard shoulder of the southbound carriageway, near junction 3a, when it caught fire in the early hours. The Highways Agency said the fire had been put out, but the lorry could not be cleared until it had cooled down. It said the closure was expected to continue through the rush-hour period, and, while diversions were in place, drivers were being advised to avoid the area. Sparks from builders working nearby set fire to Richard E Grants garden. A London Fire Brigade spokeswoman said five firefighters attended the incident in Richmond, south west London, just before 10.30am and quickly extinguished the blaze. 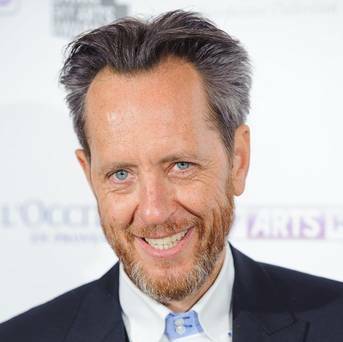 The Withnail and I actor wrote on Twitter: “Flat roofer’s blow torch set conifers on fire and 999 heroic fire brigade arrived pronto presto and have just put it out. Nerves shredded. Pheeeew.